A work crane at the Clock site in western Texas. Digging out the entrance tunnel for the Clock. 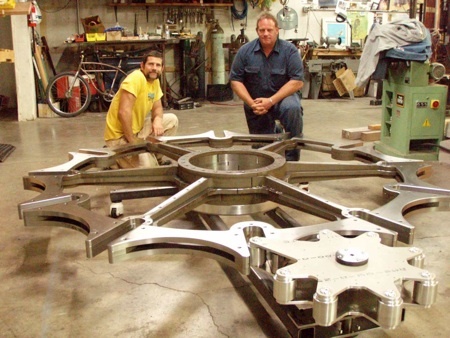 Engineer Chris Rand (right) with the first Geneva wheel part. 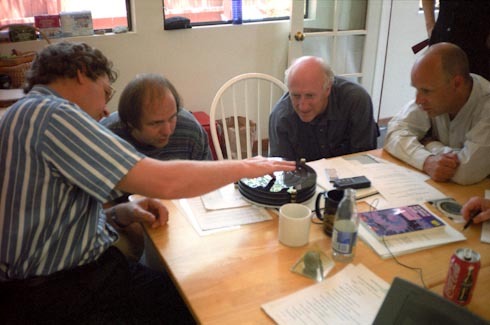 From left to right: Doug Carlston, Danny Hillis, Stewart Brand, Brian Eno inspect an early mockup of the clock’s calculating mechanism in 1996. 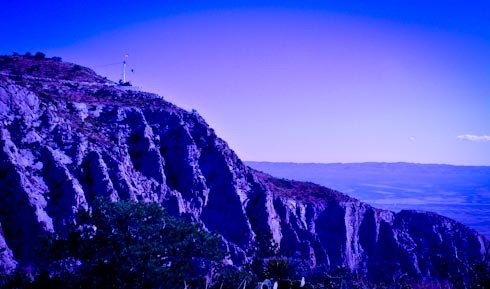 Eno also composed the never-repeating melody generator that rings the Clock’s chimes inside the mountain. Other people unhappy with our society’s short-attention span are part of this group, including me (KK), one of its charter officers. This Clock in the Mountain is being funded and built on property owned by Jeff Bezos, the founder and CEO of Amazon.com. Bezos is also very active in designing the full experience of the Clock. 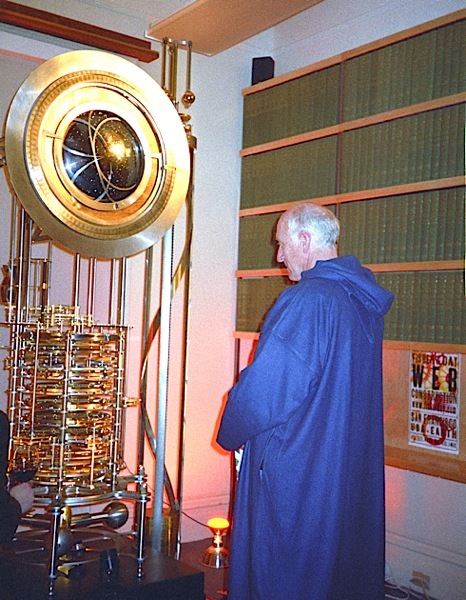 Stewart Brand, just back from Morocco, stands before the prototype clock minutes before it rings in the year 2000. In contrast to the human-scale of the prototype, the Clock in the mountain will be monumental, almost architectural in scale. It will be roughly 200 feet tall. 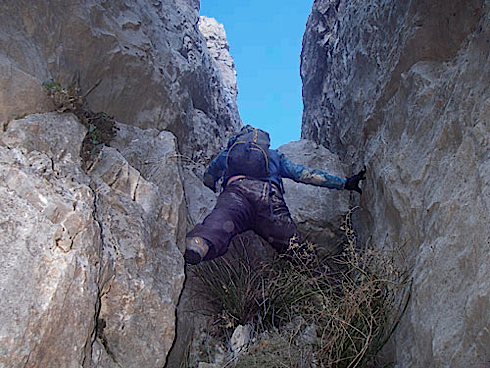 Located under a remote limestone mountain in the Sierra Diablo Mountain range in Texas, it will require a day’s hike to reach its interior gears. Just reaching the entrance tunnel situated 1500 feet above the high scrub desert will leave some visitors out of breath, nicked by thorns, and wondering what they got themselves into. The current trail up to the Clock’s entrance. A demo of the robotic stair cutter using a concrete sample. 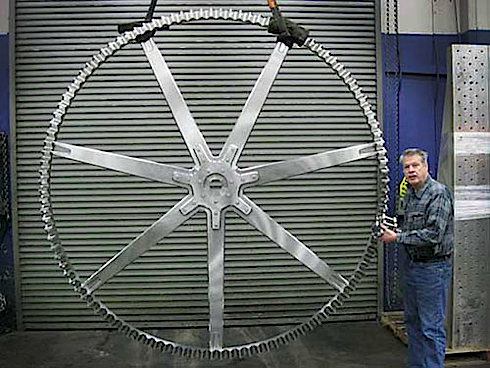 One of the gears milled from stainless steel. Each notch in the gear is inclined in 3 dimensions. 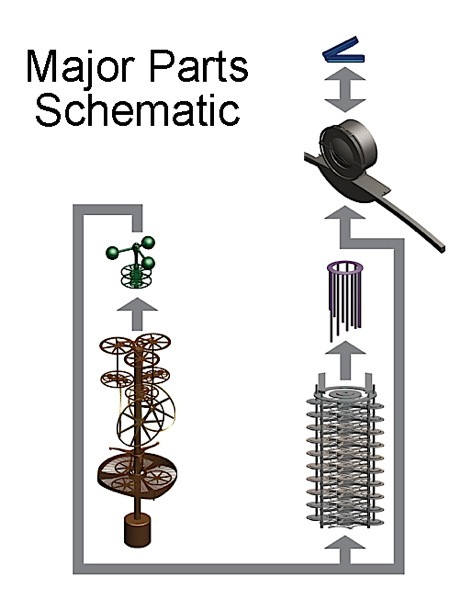 Outline of the elements that make up the Clock. Demo of the calculating mechanism. 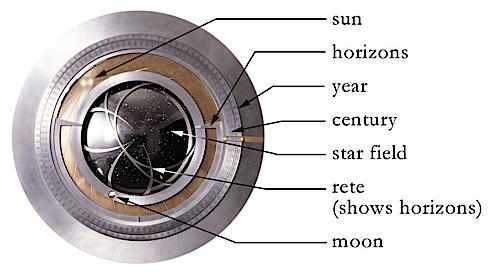 Sketch of the Clock’s face and some of the cycles it displays. If the sun shines through the clouds more often then expected, and if the nights are colder than usual, the extra power generated by this difference (beyond what is ordinarily needed to nudge the pendulum) will bleed over into the Clock weights. That means that over time, in ideal conditions, the sun will actually wind up the chimes, and wind them up sufficiently for them to ring when no one is there. 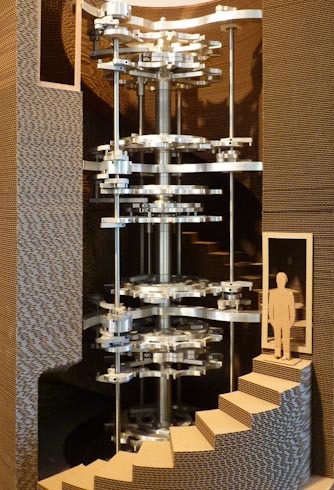 Cardboard model of the stairs and hanging mechanisms. 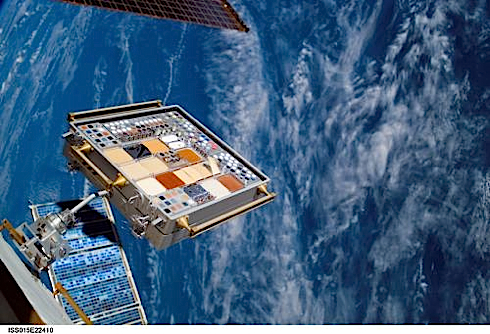 Testing the longevity of materials in space on the MISSE (not part of the Clock project). Still, the Clock is a machine with moving parts, and parts wear down and lubricants evaporate or corrode. Most of the Clock will be made in a marine grade 316 stainless steel. Because the engineering tolerances of the huge Clock are in fractions of an inch, rather than thousandths, the microscopic expansion by a film of rust won’t hurt the time keeping. The main worry of the Clockmakers is that elements of a 10K-year Clock – by definition – will move slowly. The millennial dial creeps so slowly it can be said to not move at all during your lifetime. Metals in contact with each other over those time scales can fuse – defeating the whole purpose of an ongoing timepiece. Dissimilar metals in contact can eat each other in galvanic corrosion. To counteract these tendencies some of the key moving parts of the Clock are non-metal – they are stone and hi-tech ceramics. There is more than just technology in the mountain. The ticks of time are a very human invention. Astronomical calendars are among the first pieces of culture, and often the mark of civilizations. The cave holds culture. The Clock in the mountain not only plays the music of an ever-changing slow melody, but it will collect cultural expressions of time, ticks to mark the passage of decades and centuries. Off to the side of the main cavern of the Clock are a series of small grottos to explore and collect these notices of time. Five chambers will celebrate five powers of time: 1 year, 10 years, 100 years and 1,000 years. After one year, a mechanism will be built in the first chamber. After 10 years another anniversary marked and celebration built. Future generations will have to build the contents of the remaining chambers. The local flora outside the clock at dawn. How do you become one of those time-conscious beings who visit and wind the Clock? Jeff Bezos has just launched a public web site, 10000-year-clock, where interested folks can register their desire to visit the Clock in the Mountain when it is finished many years from now. Bezos has said he will give some kind of preference to current members of the Long Now Foundation because the purpose of the Clock is to promote what the Foundation promotes: long-term thinking. Update: There is now a wonderful profile in Wired of the people involved in making the Clock in the Mountain, here. The 10000-year-clock link is broken currently, prepended by your domain. Very cool. I was wondering how the Clock was going because I hadn’t seen anything for the last few years that was beyond the prototype and sketches. For example, I hadn’t known that Monel had been abandoned in favor of stainless steel. Monel just turned out to be hard to get in the sizes and shapes we wanted, so it mostly uses a high molybdenum stainless and titanium.. The new millennium began in 2001, as there was no year 0. While strictly speaking a millennium is any thousand-year period, conventionally when we speak of a ‘new millennium’ we are speaking of thousand-year offsets from January 1, 1AD. If the clock rings in a new millennium every thousand years from 1BC, seems like the message we will be sending into the future is that, capable as we are of engineering devices to survive through the centuries, we’re a bit dodgy on the maths. We can’t say there was no year zero, because people weren’t using the Christian Calendar until several decades into the AD years. No, we can say that there was no year zero. Year 1BC was followed by year 1AD. The fact that no-one used this calendar at the time is irrelevant, because *we* use it when referring to that time period. AD means anno domini, in the year of our lord. The relevant distinction is before the birth of Christ and after the birth of Christ. Of course, if it’s not the year of one’s Lord–indeed, if one has no ‘Lord’–the ‘AD’ in dates is simply an offensive Christian imposition on everyone else. The calendar shouldn’t be calculated based on the purported year of Jesus’ birth. While it doesn’t solve the problem, we at least have ‘BCE’ and ‘CE’ as substitutes: ‘Before the Current Era’ and ‘Current Era’. It’s actually COMMON Era and Before COMMON Era not “current”. right. sorry for the error. Jesus was actually born in 4 bc. check your bible and the date of King Herod to figure it correctly. But what the heck, no one’s going to correct it now, so we have the Before Common Era, and commen Era. Or ;current’ as some people call it. Jesus is a fiction, a myth. So in reality the clock will be ringing out the old. What is wrong with that? We have been ringing out the old and in the new every New Years eve for generations. Hooray for the Clock and bless all thosewho helped build it. This is absolutely fascinating, and inspiring. As we’re caught up in the day to day minutiae of life, these guys are focused on leaving a legacy worth living on for 10,000 years. It takes guts and a sense of real humanity to focus on a project like this. Very inspiring, indeed. So, they did a test run of the prototype at the beginning of the last year of the second millennium A.D.. Was there any follow up to activate the prototype at the end of the second millennium, at the beginning of year one of the third millennium: January 1, 2001. Here is a simple experiment: count from one to ten. No matter how many times you try, it never ends at nine, always one-zero, the last number in the first series of ten. You may try the same experiment counting from one to one hundred, and one to one-thousand. It always ends with an even number having a final numeral digit of zero. It is baffling why this concept is ignored by otherwise (seemingly) intelligent people. It’s simple: Most people look at “second millennium” as being synonymous with “the one thousands”, or the “twentieth century” as “the nineteen hundreds”. Despite the fact that there was no Year Zero, it really is the more intuitive way of looking at these things. This is further enforced by the fact that we refer to decades this way too. While the second millennium did not end until December 31, 2000, the nineties, by definition, ended on December 31, 1999. You cannot claim the “Nineties” ran from January 1, 1991 to December 31, 2000, because “Nineties” is definitely not the same as “the tenth decade”. The common nomenclature is inconsistent, but most people don’t make the distinction. Although the difference is important, it seems only a few people (like you and me) actually care. People like round numbers. Everyone celebrated on the eve of 2000. It’s sort of like language. It doesn’t matter what the official rules are; what matters is what most people do or use. I can assure you that in one thousand years most people will again celebrate on the year 3000 and not 3001. The cuckoo appears when everyone is expecting it to appear. years, the initial reference point is – again – completely arbitrary. On behalf of all of the the starving children of the world … i would like to thank the organizers of this for spending so much money on such a worth while project. Honestly I think it’s a marvelous project. Sure it’s costly, but I’m sure you wouldn’t tell everyone [including yourself] to boycott the use of a cell phone so that it could be given to starving children. Or even a landline. After all, they barely even have snail mail in some of those places. I’m not saying we shouldn’t help starving children, just that this is a legacy they’re leaving behind. A Wonder of the Modern World. While we’re at it let’s also thank those who built Stonehenge, the pyramids, the great cathedrals, and all the others who have added super human beauty and wonder to the universe to offset the chaos and suffering that will always exist. I’ll thank you to leave this same comment on every single damn endeavor that costs a similar amount. Also, I think you ought to sell your computer and donate that, put your mouth where your mouth is. starving children in the world. For those thinking long term, real estate around the clocks will become valuable as people make pilgrimages. As time passes the clock’s iconic significance will transcend its functional meaning. After about 50-75 years, the clock and location will likely be seen as a window into a past culture in such a way that they will become giant functioning relics with a value beyond the purely material. As an anthropologist it is easy to imagine a form of cargo-cult worship evolving around the time piece as the clock’s building culture (ours) gets mythologized and the clock is seen as transcendent of any culture or era over time. It is a bit like knowing you will be building the mayan ruins or great pyramids in advance. Over time the clocks will pass from the profane into the sacred in structural anthropology terms. >> become valuable as people make pilgrimages. The word “clock” is a generic noun, not a name, so no capital letter, please. el gordo you will live a million years — a sense of humor is the guarantee of long life and your three words contain more hilarious unforgrettable side-splitting appropriate humor … you lucky Methusaleh. Let us scrawl our name, upon the cubicle-door of Time itself. Fascinating. I’d love to know more about how the message and purpose are being preserved and communicated forward, as the scale of the project (in “time” terms) is beyond anything I’m aware of. We still ask questions about the pyramids…will future generations have access to the ‘how and why’ of the clock? We can actually visit this place? tooth here, and some wonder why we bother to renovate when it would be so much cheaper/faster to rip out and start fresh with modern techniques and material. At times I wonder too. Our previous house had it’s hundredth birthday with us. We shovelled out the rotted log foundation and replaced it with a concrete footing pressure treated wood pony wall. Friends and family told us we were foolish (and yet still helped). Next door was a house built at the same time as ours, falling apart and condemned. If the following residents take care of our beauty it may see a 2nd century celebration, but only if at least one family is similarly “foolish”. We visited some garage sales this morning and saw 3/4 century old dresser made out of rock maple for $20. At the next stop there was a piece made of pressed fibre board and staples with nicks and scratches and broken corners for $500; not likely to be much more than a decade old, if that. I like what you are doing. It’s important. Thank you for being wise fools, and telling us about it. I’ve been following this project since I first read about it in one one the Whole Earth publications some years back. I just want to express my gratitude to the people who are making this project happen. Are there still replacement parts available to pass down to ones children? This is a great and inspired project. Thank you for all your work. Approximately when do you expect the big clock to start running? 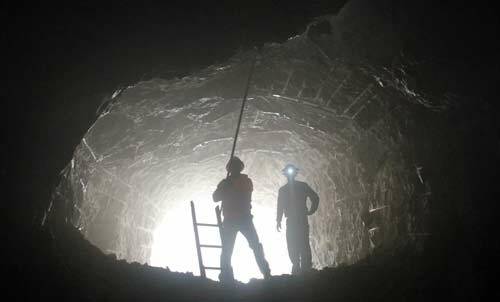 A technical concern: won’t the thermal energy-harvesting mechanism require inspection and maintenance? Those moving parts will be more vulnerable to damage than the rest of the clock because of temperature cycling, weather, wind, geologic motion and possible tampering. Like a cathedral, you mean? I love love the concept but where did the funding for this come from? From the guy who founded amazon.com, Jeff Bezos. Is there any effort to account for the fact that, regardless of wobbles, the solar noon isn’t a perfect accounting of time elapsed? Doesn’t solar noon depends on lat/long? I assume that on this timescale you have to account for continental drift. It’s a different meaning of tracking time if you’re counting the number of local solar noons (to some high degree of precision) rather than the actual number of seconds that have elapsed since the clock was set running. Yes, there are various designs in the works to compensate for all manner of deviations and variations that come up with the problem of measuring long periods of time. I did not mention them because a) they are very complicated, and b) they are unfinished. Keep tuned! “Ozymandias”, my favorite Shelley, is a threnody to self-aggrandizement. The clock is not about that. $42M would plant a beautiful proto-Old-Growth forest but our descendants, yours and mine, would only cut it down. Thank you for this beautiful telling of the story, which will only achieve the goal of cultural change with meaningful exposure. And thanks for reminding me to join Long Now. Somebody’s got more money than sense if they believe future generations are going to be impressed by a merchant’s fancy clock in a hill. If Bezos wants to be remembered, he should spend his spare cash on preserving some of the many species this era of humanity is wiping out. Bezos is not building it to be remembered. In fact he calls himself the “first steward” of the Clock because he knows he will not be remembered, and that many will come after him. His name appears no where on the clock so it is very certain he will not be remembered in several hundred years. You are right, though. Building a clock deep inside a mountain in the middle of nowhere is a poor choice for trying to impress people. Yet another attempt at the futile battle against impermanence. …as is your next meal. Or your next breath for that matter. The very definition of life could be characterized as a futile battle against entropy. Just because the ultimate end result is dissolution and chaos doesn’t mean the effort to build something grand is not worth it. Somewhat reminds me of the monastic avout celebrating Apert in Neal Stephenson’s Anathem. Wouldn’t be surprised if some of the people working on this have read that. I would suspect that this clock could only strongly attract such a community permanaently nearby. My understanding is that Anathem was inspired by this project, not the other way around. Correct. Neal joined us on several of our Long Now camps at the Nevada site of the clock. OK, silly question. What about erosion around the ‘window’? What happens if there is a earthquake or landslide nearby that jostles the whole thing? I feel uncomfortable about the objective value of the project, but as a work of … art of technology perhaps? … it certainly is imposing and surreal. Having read through all of the e-mail comments and replies, I find it almost depressing that nearly everyone except the originators of this monument have missed the point. They all seem to think it is “about them”, personal and possessive. The nay-sayers refute man-kind and civilization in general, and humanity in specifics. They seem each to be unaware of human kind and human history and survival. Their only concept is right or wrong, on their terms. How can we be so small that we cannot grasp the infinite? Those who have the intelligence and ability to understand the creativity and wonder of this magnificent monument to unselfish denial of recognition of their personal egos, and who have made this personal sacrifice of time and resources to leave a beacon to future generations that we were not perfect, but we were significant will be inspired. How then does this become offensive to any rational human being? It does not offend me, it only inspires me to remember that each of us will leave an indelible mark on the world. It may be small, or it may be huge, but whatever it may be, it should be an inspiration to those who follow, and to do likewise if helpful, and not to do likewise, if harmful. Are the design details available e.g. for the solar synchronizer ? Are there opportunities for the interested person to provide feedback on the design, suggest improvement, etc. i.e. to get technically involved in some manner ? Good question. If you have expertise to share send me an email kk at kk org and I’ll forward it to Zander Rose, who is overseeing the project. I love the concept, and support the idea of our civilisation building enduring marvels such as this to last millennia. But I couldn’t help but wonder whether you guys might build a precision Foucault Pendulum into the clock, which aside from the coolness factor (in my mind!) and its relation to measuring the natural cycles of our Earth, might also be tapped for small amounts of energy to power such a slowly ticking clock, its mechanism and chimes? It was talked about, but I forget why we passed over the idea. Message in a bottle? I knew nothing of this project prior to reading this piece. I recently saw Werner Herzog’s Cave of Forgotten Dreams (about paintings created in a single cave over a 5000 year timeframe starting 30,000 years ago) and I’m struck by what must be a human impulse to leave a mark, however faint and anonymous, on the infinite. Nazca plains, Stonehenge, Gobekli Tepe, etc.–usually the explanation for the existence of these projects that push a given society’s science and technical capabilities to the outer edge is that they must be in the service of god(s). What god might those who discover the clock millennia from now think we worshipped? If it is nothing more than showing that despite pettiness, violence, and shortsightedness, we are still capable of achieving something of great beauty, it is well worth it. Sustainable grazing program? 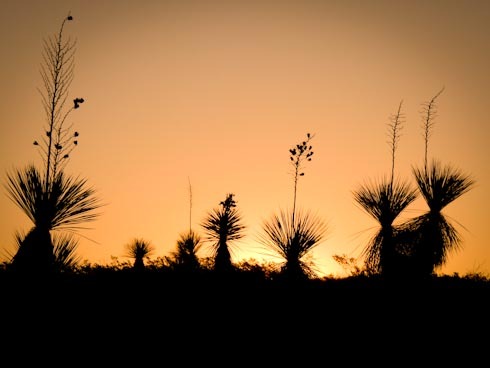 Have you ever been to far west Texas? Using land to feed grazing animals is about the least efficient way to create food for humans. Well, in true Texas fashion, it is his land and he can do what he likes with it. It takes 40 acres in west texas to feed one head of cattle. No efficient is that? Bob, you are mistaken. A million acres have not been “taken out of production.” Did you make this up? Why isn’t the daily difference in barometric pressure used instead of a temperature differential to wind the clock? I don’t know why, but it was considered. I find it absolutely astonishing that they’re working on something like this. Many people wonder ‘Why did they build the pyramids?’, ‘What purpose were the space-visible designs on the ground from centruries ago’ representing? This is on that scale. Something like this may very well be found 10,000 or even 100,000 years from now and whomever (or whatever) finds it will certainly be left with a puzzle to ponder: why in the world did they build a clock like this? As some others have pointed out, I don’t understand why this is so complex. If it simply keeping track of the number of rotations of the Earth (as indicated by the compensation for high noon), then aren’t there easier ways to count the number of times the sun rises? Sure, you might want to divide the day into smaller pieces (hours:min:sec), but if you are going to re-zero your clock at noon every day, then the clock does not need to be very inherently accurate. Who cares if it reads 8943 years, 24 days, 5 hours, 21 min, 5 sec, or 4 hours, 3 min, 44 sec? A 6 foot long pendulum has a period of 2.8 seconds. To get the 10 second period mentioned in the article, the pendulum would need to have its center of mass more than 80 feet below the fulcrum (81’5″ actually). Am I missing something or was there a typo in the story? No, that doesn’t work. If the “radius of gyration” must be 80 feet from the pivot, then the actual pendulum must be much LONGER than that, not shorter. Indeed. Most of the “time” no human will be around to appreciate the Clock’s antics. I’m afraid that when the Taliban conquers us, they will blow this clock up along with other cultural artifacts deemed sacrilegious. Would the clockmakers be willing to inscribe quotes from the Koran (in Arabic) on the clockface in order to protect against this? Thank you. thousands of years.” See a rendition of version 1 here: http://rosettaproject.org/disk/interactive/. If my memory serves it does contain the entire Koran in Arabic. That said I doubt this would pacify the Taliban. Extreme fundamentalists generally have no tolerance for coexistence with other viewpoints. Concentrated attack from inimical humans may well be the clock’s greatest threat. Still from what I’ve read I think these projects have the best protection possible from ourselves, better than anything we’ve created thus far anyway. The Taliban will likely be gone in one generation. Islam as a whole will eventually undergo its own reformation. But it would be a good idea to have the major religions of the world “bless” the Clock. Why do we need a clock that will tick for 10,000 years buried inside a mountain where people can not see it or appreciate its design? Out of sight out of mind! This is a terrible idea on so many levels, the first being….hasn’t the earth accommodated being ravaged for enough reasons? And then there’s the interference with the heartbeat of the earth – her vibration – her beat. Total invasion and manipulation. given the big money bags and scientist behind this – I doubt the motives being communicated are true. And what is up with the adoration of time? Clocks are a mechanistic, militaristic, obedience producing apparatus that gave birth to the current robotic american way of life that is now destroying families and life on earth. why not take all that money and ingenuity and do something that doesn’t further entrench outdated ideas such as ticking time and that doesn’t further damage earth. There are more families and more life on earth than ever, especially since clocks have been invented. What an endeavor –filled with awe and inspiration for the larger breadth of humankind and civilization…To create a vehicle for us and future generations to think about what small impact each of us plays in the larger constellation of the ongoing and ever-changing web of life! I salute the minds and facilitators of this project and all who ponder its implications! Incredible. Not at all surprising coming from Stewart Brand, of Whole Earth Catalogue fame. This is the ultimate gesture from the generation that set out to change the world in the 60s – hippies, Earth Day and the rest. Indeed, are we being good ancestors! Considering the age of the universe, this clock would be considered as a recently manufactured item in the unlikely event of this Planet remaining intact up to the intended period. It depends, besides nature’s forces, on man-made disaster like world’s nuclear arsenal being detonated by one or more nations on Earth intentionally and/or accidentally. I have not been able to grasp the ultimate benefit for mankind on this planet through such enterprise. Nevertheless, it is much better and harmless than inventing the WMD. You are right, Rajeeve; ‘you are free to pursue your interest’. Never last. Some moron will destroy it within a hundred years of its starting. from rudimentary house platforms. In a dark future, the clock mechanism would be a veritable mine for esteemed non-rusting steel and other materials. In 10000years people will be saying that the world is going to end because that is how long the clock is going to last . Just like they are now because the Mayan calender is running out. Better put an explanation on it! Since you are involved in a clock makeing for future ,then why not make a machine which will give us unlimited elctic power so we can cut out the utlity companies. And a machine to clean salt water to make fresh water. Or a fuel for water cars. Or perhaps make a car that flys to cut out roads. great post always nice to see these kind of things here. I have admired Stewart Brand and this Clock of the Long Now Project for quite a while. I am very happy that Jeff Bezos is now a big supporter. I really like their collective ambition and wish them all great and lasting success. Remain “clock-sure”, my friends! The pulses are then added up in a chain of some type of counters to express the time in convenient units, usually seconds, minutes, hours, etc. Then finally some kind of indicator displays the result in a human-readable form. Google began personalizing search results for each user. Depending on their history of previous searches, Google crafted results for logged in users. A park is a protected area, in its natural or semi-natural state, or planted, and set aside for human recreation and enjoyment, or for the protection of wildlife or natural habitats. It may consist of rocks, soil, water, flora andfauna and grass areas. Many parks are legally protected by law. The capacity to create and understand the meaning of ideas is considered to be an essential and defining feature of human beings. In a popular sense, an idea arises in a reflex, spontaneous manner, even without thinking or serious reflection, for example, when we talk about the idea of a person or a place. principal application was the design and theory of radio transmitters, receivers and vacuum tubes. napes of their necks, or used depilatory cream to remove it, if it would otherwise be visible at the edges of their hair coverings. Working-class women in this period wore their hair in simple styles. of access and the point of exit the user walks through an airlock. to the Oeko-tex certification standard which contains limits levels for the use of certain chemicals in textiles products. A monument to time or to founder egos? Nature already models the slow and steady passage of time. instead of putting the money and genius to address, say, climate change or water shortage or put food on peoples’ tables or stop humans from beating up nature, we’re doomed! Come on Long Now Foundation. where’s the courage to stand up to your peers and question this project? Actually, Christianity only makes up 1/3 of the world’s population. I think it’s safe to assume they would be the minority.